First, I’d like to say it’s cold in Paris right now. Very cold. 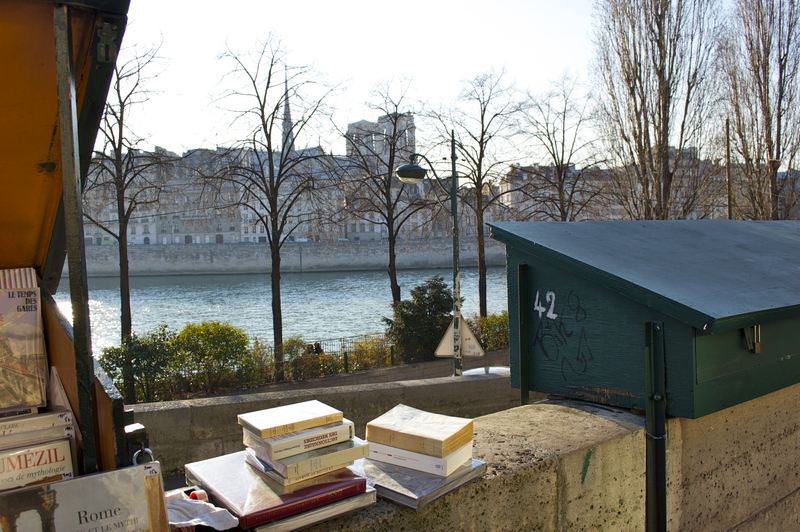 This weekend we went to have a look at the green booksellers’ stands along the Seine. “Bouquinistes” have been selling old books, magazines, posters, etc. 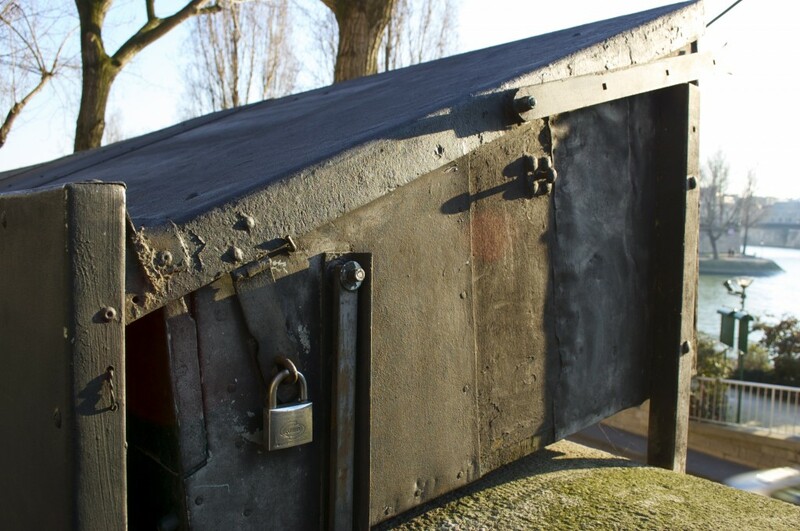 along the riverbanks for centuries and since 1991 the “boxes” have been classed as a UNESCO World Heritage Site. For the last several months, the City has been repainting those in need. 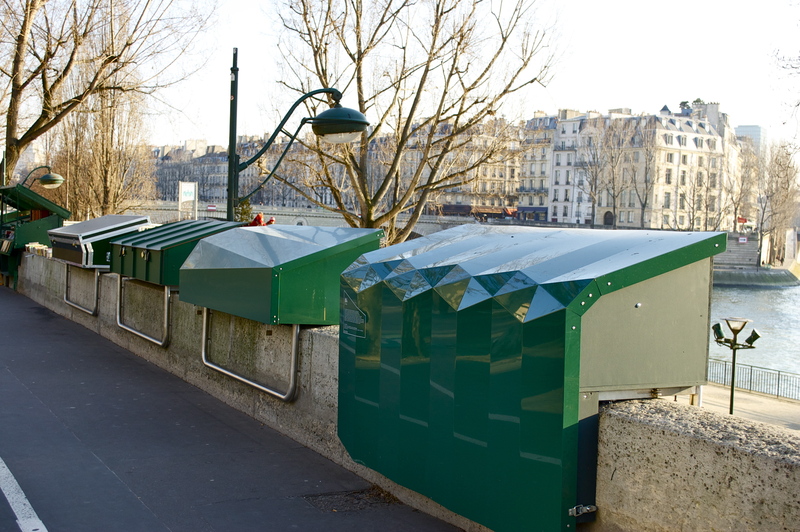 Now, several prototypes are on display for possible replacement of hundreds of traditional boxes currently lining the Seine. There are somewhere between 900 and 1,000 boxes and about 230 booksellers concerned. The prototypes, designed by Matériaupôle Paris Seine Amont, are exposed near the Hotel de Ville. The idea is to “modernize” the boxes and make everyday outdoor life for the “bouquinistes” easier. In the near future, the stands may be equipped with heating systems and protection against rain. (Did I mention it’s cold in Paris right now? Very cold?). The plan is also to have them specially treated against graffiti. So, for the past few weeks, the specialists (the booksellers themselves) have been able to test out these new boxes, and passers-by have been able to ogle them. What do you think??? I did mention it was cold, so here’s how we’ve been keeping warm: buckwheat “galettes” and sweet crepes. It all started Thursday evening. February 2 is traditionally a religious celebration, the presentation of Christ at the Temple of Jerusalem, but if you ask any French kid what “Chandeleur” is, they’ll tell you it’s the day you eat crepes. Thus, Joy made crepe batter – lots of crepe batter. This is actually why I was glad it was so cold this weekend. I had lots of crepe batter to store, but our fridge (as I’ve probably mentioned at some point) is rather small. There was no fitting it all in (not with the half butternut squash, lettuce spinner, champagne bottle, tahini, almond butter, milk, hummus experiment…etc…etc… already in there). The magic solution was storing it in the cupboard under the windowsill – believe it or not, this sport was colder than the actual fridge! 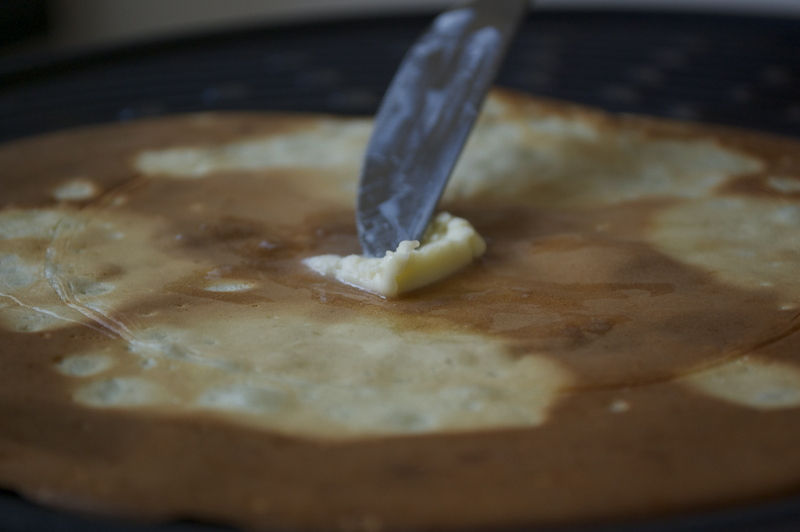 Here are two recipes: one for savory Buckwheat “galettes” (as made in Brittany) and one for dessert crepes (this is an updated version since my last crepe post). What made the real difference in the sweet crepes was my French grandmother’s secret: crème fraîche. To make them smell wonderful, I added some fleur d’oranger (orange blossom water found in the baking isle of French grocery stores) and some vanilla extract. The other secret is to let the batter sit overnight (or in our case, a couple of days). 1. Pour flour and salt into a large mixing bowl. 2. In a small bowl, beat the egg. 3. Add the egg and a little water to the flour. Continue adding water and mixing until you have a batter. Thick ribbons should form when you lift the whisk. 4. Let sit for at least a couple hours then cook over a hot griddle. 5. Decorate with your favorite ingredients. 2. In a large bowl, mix flour, salt and sugar. 3. In a small bowl, beat the eggs. 4. Add the eggs, butter and some milk to the dry ingredients. Slowly add more milk and mix until you get thick ribbons of batter when you lift the whisk. 5. Add the remaining ingredients and let sit at least two hours (overnight really makes a difference!). 6. Cook on a hot skillet and decorate with your favorite ingredients. This entry was posted in Everyday Life in Paris, Recipes (All), Recipes (Gluten-free) and tagged books, cheese, chocolate, dessert, fruit, mains. Bookmark the permalink.